Justseeds | 11th Annual Prints Gone Wild! 11th Annual Prints Gone Wild! between. 3rd and 4th Aves. The tenth-ever annual printacular mega-hairy, Brooklyn affordable print fair! THE ORIGINAL 50 Bucks and Under American Print Fair. 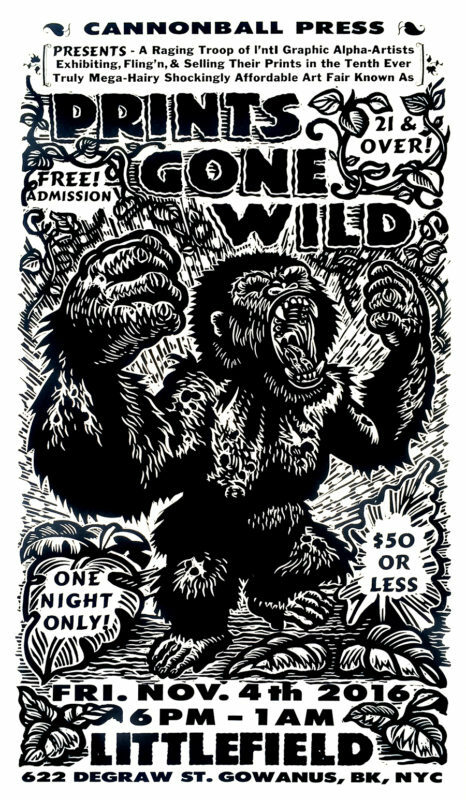 Brooklyn’s own legendary Cannonball Press has again assembled an extraordinary menagerie of graphic artists under one roof who will be present displaying and selling their prints for $50 or less for one night only on Nov. 4th 2016, at Littlefield NYC. As part of New York Fine Art Print Week, organized by the International Fine Print Dealers Association in conjunction with the Annual IFPDA Pint Fair, long-time champion of the affordable art cause Cannonball Press has brought together these great artists so that New York can have a chance to see first-hand the incredible resurgence in affordable fine art printing that is happening across the country. Come join us for live printing, beer, music, and an alpha display of awesome cheap prints!!! FRIDAY, NOVEMBER 4TH, 2016. 6pm – 1am. betweenn. 3rd and 4th Aves. Take the 2, 3, 4, 5, B, D, N, or Q to Atlantic Terminal or the R train to Union St.
Free admission. 21 and over only.